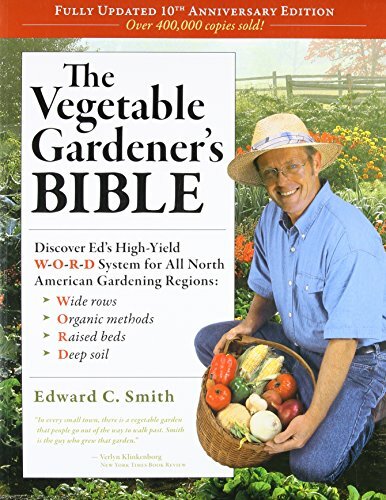 Disclosure: My parents received a copy of the original edition of The Vegetable Gardener's Bible, 2nd Edition: Discover Ed's High-Yield W-O-R-D System for All North American Gardening Regions: Wide Rows, Organic Methods, Raised Beds, Deep Soil free of charge due to an acquaintance in the author’s family. My parents get a significant amount of their produce every year from their large organic vegetable garden, and they’ve been gardening for a combined total of something like 70 or 80 years, so they didn’t expect to learn much when they were given a free copy of this book and I wouldn’t say that they did. However, the information in the book is so clear, comprehensive, and well organized that it’s become one of their go-to reference books, and they gave me a copy when I moved out of the house and started a garden of my own. As a relative beginner (I helped with bed preparation, weeding, watering, and harvesting growing up, but not so much with planning, seed starting, or pest control), this book was absolutely indispensable.